Less than a month after the killing of Trayvon Martin in Florida, Shaima Alawadi, an Iraqi immigrant living with her five children and husband, was found beaten to death in her San Diego home. A note found next to her body read, “This is my country. Go back to yours, terrorist.” Despite the hesitancy of law enforcement, and conflicting information regarding Shaima’s difficult family life, many have begun to classify the murder as a hate crime. Like Martin’s s killing, Alawadi’s has also resulted in a fairly broad public movement via social media. One Million Hijabs for Shaima Alawadi, for example, has called for women to show solidarity by posting pictures of themselves in hijab. A great many (who do not ordinarily wear it) pledged to do so for a few days, and then blogged or posted videos concerning their experiences after appearing in public.These experiences seem to be quite varied, yielding a rather complex picture of ill treatment in some cases and acceptance and even support in others. 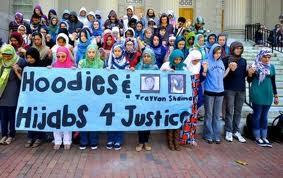 In still other instances, public protests and gatherings have emphasized that which the Martin and Alawadi killings have in common: the hoodie and hijab as publicly marking identities different from those of the dominant white and non-Muslim culture. A great deal, then, is at stake in the identities we embody, sometimes as much as life and death. This entry was posted in Politics and Religion, Religion and Popular Culture, Religion and Society, Summar Shoaib and tagged demonstrations, Hijab, hoodie, Iraqi Americans, Islam, killing, Murder, Musliams, Shaima Alawadi, Trayvon Martin, women, You Tube. Bookmark the permalink. This country today is really polarized, and I primarily blame the media, activists and the politicians for this, as there is a benefit to them for doing so. On the other hand, the groups themselves have not helped the situation either. For example, the fundamentalist Islamics have bombed us, beheaded their captives, terrorized people whothey decide mock their religious articles, stoned to death their own people for what most would call relatively minor infractions, control their people in rigid conditions, have openly declared their hatred of the west and in fact have called for our complete and utter destruction. Yet I have yet to hear from any Muslim here in the states, or anywhere for that matter voice their support for their adopted homeland, decry the tactics of their people, or make any real effort to understand the culture of where they choose to live, yet expect that culture to make new rules to accomodate them. That’s not right either. I’m sure that most of these folks are peaceful, decent people. But until they show by talk and action where they are coming from then it is not unreasonable toassume there will be a great divide. In light of the probable cause of Alawadi’s murder (or, at least, the very real Honour Killings that do happen to both women and some men): Those poor foolish protestors should really be protesting in front of a mosque, by removing the hajib. Then some can put them back on. And everyone respects each others’ choices. To show women have a choice, and it’s not for any Old World culture, religion, or men to dictate to them. But, those protestors will never do something like that : they only like inane feel-good protests (pretending white men are the only evil) than really caring about victims.